I have enjoyed beers by Crazy Mountain Brewing Company over the past year or so, and their releases are making their way into our craft beer market here in San Antonio, TX. The first thing that drew me to this beer was the name, and of course the nice looking label that dawns the bottle. But we all know that the label or beer name does not make up for what’s inside the bottle. So let’s see what we got here. 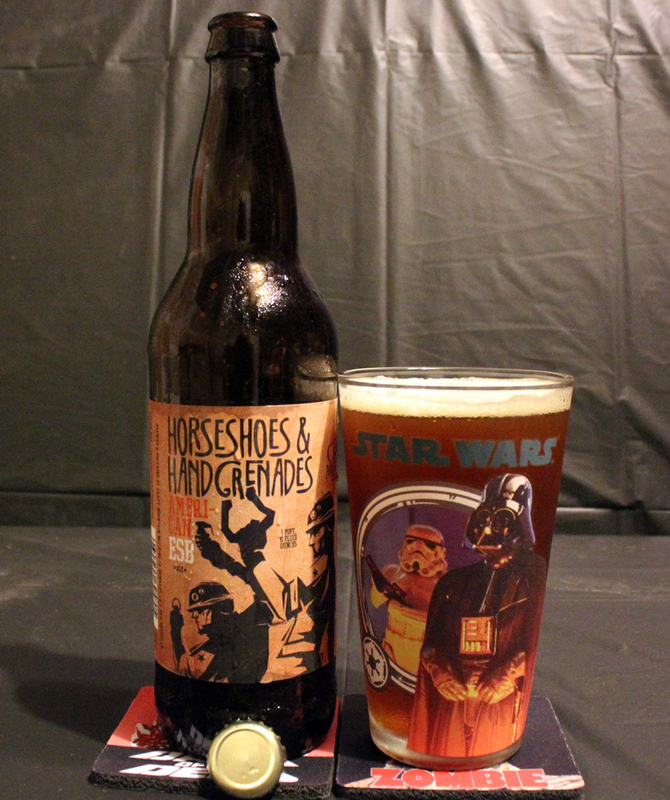 Poured into my Star Wars Darth Vader pint glass, this beer is a hazy dark brown color, with hues of red shining through. It is topped off with an off white, near beige colored bubbly head, which held a solid ring atop the beer, leaving soap-like lacing down the glass. The thing about this style of beer is that there isn’t much to the aroma to begin with. There’s no added fruits, spices or anything that pops out at you. what we have here is a nose full of caramel malts, a little toffee sweetness. There is a slight bitterness to the aroma that hits my nose at the end and lingers a bit. My nose unfortunately doesn’t pick up on anything else here. Flavors are apparent here, as there isn’t much complexity to this style of beer. There is a strong bready, biscuit flavor right up front, followed by a body of toffee, caramel malt. There is a slight sweetness, like a bit of brown sugar in there. This one definitely bitter, but no real hop profile exists for me here. There is a bit of a crisp, peppery note to this as well at the end, but has a lingering caramel malt flavor. The body was a bit thin, which was I was a little put off by that. This beer was well carbonated. The mouth feel was thin and crisp. There was no real alcohol burn either. This one was definitely an easy drinker. Overall, I was neither blown away by this beer, nor was I put off by it either. This is a good filler beer. It’s like those songs on an album in between the singles that you will listen to but they don’t leave a lasting impression like the singles do. Just like the album though, Crazy Mountain does have those hits as well, as I have had some good beers from them. I guess I also need to drink more ESBs, as I remember being turned off to them a long time ago when i had one that I did not like, and I never really looked back to this style until now that I created this website. I’m sure I will find the good in these, and they will eventually grow on me. Metal Connection: With the label obviously depicting soldiers, the first thing that came to mind was the “grenades” part of the name, and of course a war theme. That was easy, as there are tons of Metal bands who’s lyrical theme is about war. As it turned out, making this choice was not as easy as I thought it would be. I went through several bands, and their discography before settling on the song “Cannon Fodder” by the amazing German Thrash Metal band, Sodom. This song comes from their 10th studio full length album, M-16. Here is a fun fact for you as well… This song is one of the only songs I found that actually uses the word grenade within the lyrics. I searched through many lyrics, only to be lead to this one song. Luckily I knew and liked this song, cause then my search would have been pointless!